An "Official Notice of Human Rights Violations" was delivered to the military at the Army's Stryker hearing on on Tuesday, November 4, 2003 (the anniversary of the U.S. "Proxmire Act" implementing the UN Genocide Convention). 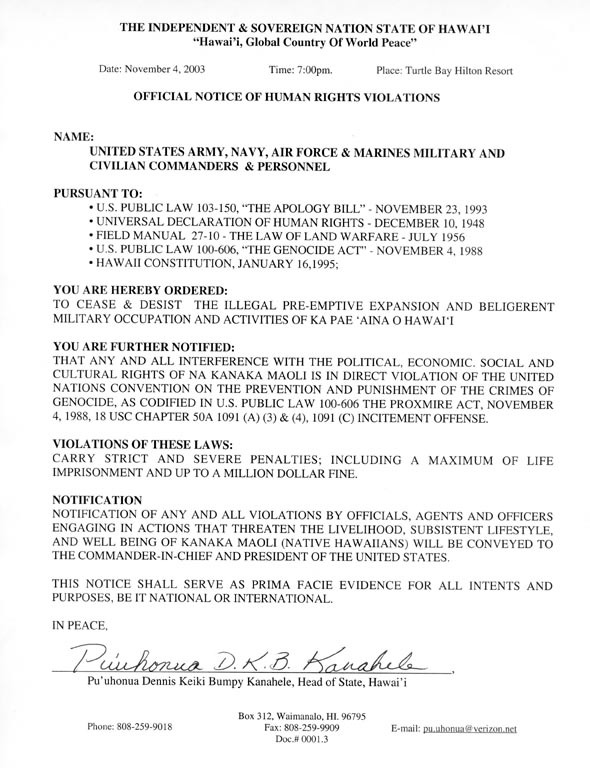 "Hawai'i, Global Country Of World Peace"
THAT ANY AND ALL INTERFERENCE WITH THE POLITICAL, ECONOMIC, SOCIAL AND CULTURAL RIGHTS OF NA KANAKA MAOLI IS IN DIRECT VIOLATION OF THE UNITED NATIONS CONVENTION ON THE PREVENTION AND PUNISHMENT OF THE CRIMES OF GENOCIDE, AS CODIFIED IN U.S. PUBLIC LAW 100-606 THE PROXMIRE ACT, NOVEMBER 4, 1988, 18 USC CHAPTER 50A 1091 (A) (3) & (4), 1091 (C) INCITEMENT OFFENSE. CARRY STRICT AND SEVERE PENALTIES; INCLUDING A MAXIMUM OF LIFE IMPRISONMENT AND UP TO A MILLION DOLLAR FINE. NOTIFICATION OF ANY AND ALL VIOLATIONS BY OFFICIALS, AGENTS AND OFFICERS ENGAGING IN ACTIONS THAT THREATEN THE LIVELIHOOD, SUBSISTENT LIFESTYLE, AND WELL BEING OF KANAKA MAOLI (NATIVE HAWAIIANS) WILL BE CONVEYED TO THE COMMANDER-IN-CHIEF AND PRESIDENT OF THE UNITED STATES. THIS NOTICE SHALL SERVE AS PRIMA FACIE EVIDENCE FOR ALL INTENTS AND PURPOSES, BE IT NATIONAL OR INTERNATIONAL.